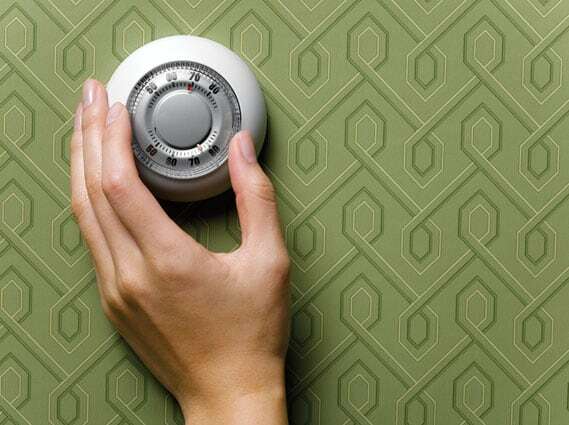 It is time to switch to a programmable thermostat to heat a home more efficiently. With colder weather right around the corner, many homeowners are once again giving thought to their home heating needs and if it is possible to heat their homes more efficiently. The United States Department of Energy reports that more than half of the energy used in a typical home goes toward heating and cooling costs. With energy costs continually on the rise, many homeowners want to make the most of their heating systems and use the heat in the most efficient manner possible. A heating system is most effective when the home is free from drafts. Before investing in a new furnace or considering other drastic changes, determine if a few simple repairs can help your heating system perform more efficiently. Check around doors and windows for drafts that could force heating systems to work harder, and seal any leaks you find. This also will help in the summer when you are trying to keep the house as cool as possible. Determine if cold air is infiltrating the home elsewhere, such as from around pipes leading to the outdoors. Caulking or foam insulation can remedy the situation. Adding extra insulation in garages and attics also can help. The DOE says if insulation is less than R-30, the home probably can use more. If after increasing insulation your home still feels drafty, it may require additional insulation in the exterior walls. Invest in a quality thermostat. Many modern room thermostats allow homeowners to set different temperatures for different times of day, and some even allow homeowners to establish a different heating schedule for the weekends. Programmable thermostats allow homeowners to keep their homes cooler when unattended or during sleeping hours. The heat can be programmed to turn on or increase in temperature when residents are expected to return home after school or work. While homeowners are improving heating efficiency, they should reverse the direction of ceiling fan blades. Having the blades spin clockwise will draw down the hot air that rises to the ceiling and allow it to better flow through the home. In addition to these suggestions, homeowners can employ these other energy- and cost-saving measures. Reuse oven heat. After cooking a meal in the oven, open the oven door and let the residual heat escape into the kitchen and the rest of the house. Note, it is not safe to heat a home with the oven, and the oven should be turned off before opening the door. Add a little humidity. Moist air tends to hold heat better. Add some humidity to dry indoor air, particularly if the relative humidity of the home as measured with a hygrometer is below 25 percent. Houseplants and home aquariums can add some warm moisture to the air and reduce reliance on heat. Limit use of exhaust fans. After showering or cooking, keep the exhaust fan on for as little time as possible so that warm air is not drawn out of the home. Heating a home efficiently means reducing drafts, programming the thermostat and making the most of other ways to warm up.